Our Designer Kit - The Advanced Carbon, is an elaboration of our highly technical features that are built into our racing clothing. This is a snug racer fit cycling jersey developed to be aerodynamic, snug and highly breathable. The technical nature of the carbon fibers add big benefits to the bicycle rider. Fit is snug for aerodynamics on a bicycle. This is part of our Premiere Jersey collection that was developed to address the needs of a competitive cycling team. Always good for a weekend club ride, the peloton jersey is crafted from a combination of fabrics that are highly technical. The microfiber polyester yarns are tightly knitted for the wicking sweat away and keeping cool on hot days. The sleeves fit to the shoulders perfectly and comfortably. Available in sizes X-Small to 3XL and crafted with pride in the USA. 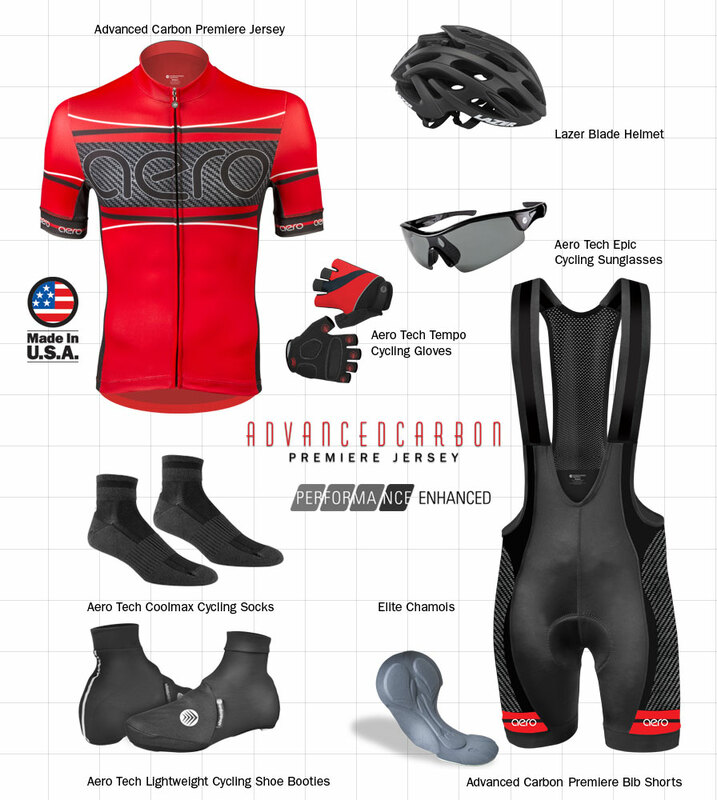 Here we are presenting the Premier Advanced Carbon Racing Jersey - The perfect blend of aerodynamic tailoring and top of the line fabric make this jersey fit to be called elite. Designed for the cycling position, the set-in sleeves of the Premiere Jersey create a beautiful fit from the neck and shoulder to the bicep. This gives the Premiere Jersey an aerodynamic advantage by fitting tight against the rider's body allowing air to flow freely over the body and eliminate air pockets in the fabric. The Aero Tech Designs Power-Cuff is crafted from honey-comb polyester micro-mesh material. The Power-Cuff allows muscles to flex during effort but does not bind or restrict muscle movement. The cut is slightly longer so it stays in place and never looks like a muffin top. Honey-comb fabric has carbon infused fibers knitted-in to help vent heat buildup and enhance ventilation. The body is sleek and stretchy with a highly technical blend of knitted yarns. The core fabric is 94% polyester and 6% Lycra, to provide the perfect amount of stretch. This extra bit of spandex will give riders a tailored race fit but still allow for comfortable movement both on and off the bike. The fabric has highly technical polyester micro-fibers that wick perspiration away from the body and keep the garment dry and cool in all weather conditions. Carbon fiber knitted into the fabric, to help manage moisture and keep body temperatures down, this Jersey is designed with honey-comb, carbon infused side panels. The extra cooling on the side panels and arm pits create a cool garment for summertime races and hard workouts. The carbon, honey-comb textured side panels start at the underarm and continue to the bottom of the jersey. Additional visibility with 3M reflective element below the rear pocket. Another value added quality of this garment is the 3M Scotchlite™ Reflective Material which is sewn in a key location on the back of the jersey. Proudly Manufactured in Pittsburgh, Pa.
Back view of racing jersey shows the silicone gripper to keep the jersey down and in place. No flapping in the wind with the snug fit and fabrics. Living in a very humid, tropical environment breathability is very important to me, and this jersey delivers in this category. It is definitely much tighter than the standard Aero Tech jerseys especially in the chest area. Accessing the pockets on the bike can prove to be a little bit of a challenge compared to other jerseys I have worn. It is also not quite as red as the picture appears on the monitor, to me it looks slightly more orange. This product is a pro-level fit with top-quality materials for wicking sweat away from you body. Pictures do not do this product justice, as colors are vibrant! If you are seeking a pro-level jersey at a value price look no further! This jersey is a favorite of mine. Keep in mind that it is a "Race" fit, so it really fits your body nice and tight. Not the tight that leads to discomfort as it stretches so well. I am 6'1" @175 lbs, 34 waist and 39 chest under the arms. I followed the sizing chart and it was spot on for me. Great summer jersey, no binding anywhere, just a fantastic product, not to mention the great looks. Washed several times on Delicate cycle, no problems so far. Good Looking! And it fits very well! I'm much larger than the average cyclist and finding larger cycling gear has been a challenge until I met Aero Teck Designs! I'm grateful and proudly advertise for them. One of the nicest Jerseys I have ever had. Top quality material, great fit, nicely made. I'm not an avid cyclist but I've ridden for several years (generally 15-20 miles on Saturdays). I purchased this jersey because I was buying the matching bibs and the jerseys I had would have clashed (I already look like a stuffed sausage in cycling gear... didn't need to make it worse) and it was on sale. This is by far the most comfortable jersey I've ever worn. I've only gone on one ride (31 miles in Los Angeles... high of 65) but I was noticeably cooler than with any other jersey I've worn. I'm 5' 11" and 195 (all fat) and the XL fit perfectly, snug as it's supposed to be, without making me look like I was riding from donut shop to donut shop. I ordered this in the size recommended although I doubt it would fit. The fit was perfect. The order was filled, shipped and arrived as scheduled. The jersey is attractive, well made and comfortable. Purchased the jersey and wore it on a 5 day 340 mile journey (C&O/GAP). It was the only jersey I wore on the trip. Washed it every night and air dried it. At end of trip noted that there was "pilling" of the fabric. Doesn't affect the performance and probably I am the only one who notices. Still wear it, still like it. manufactures are not true to size. I have a long waist (I wear tall shirts and undershirts) and tried Aero's Tall products. time you zip up the shirt. Perhaps my favorite jersey! The looks about it, made in the USA. Very comfortable. Love the design and the feel. I got a size larger on the shirt for some breathing room. There service and care for detail was right on point. Nice to be able to speak to someone selling and knowing there merchandise.